Well, we don't want to keep you on the edge of your seats any longer. Part II of the update involves the "where next" question. First of all, we appreciate the many prayers and counsel that have come our way as we've sought out how to take this next step. There are a great many people that put a lot of effort into helping us make this decision--various missions agencies, people in a number of different countries setting up travel plans and itineraries, and many of you back home asking thought provoking questions--thanks to you all. And when we say we've "made a decision" on where to go next, what we mean is that it seems like all the right doors are opening to one particular country, but we are not saying that it is here or nowhere. All of us know that God can move in a variety of ways and we want to be open to hearing His calling in the months to come. 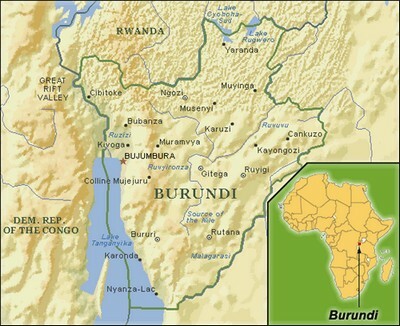 That being said, the country that seems to make the most sense for us at this point in time is Burundi. We have decided to pursue that option above all others, for several reasons. One is that, as Eric said, "they seem to have a McCropder-shaped hole there." We feel that the needs of Burundi in staffing a Christian hospital to be the primary teaching site for a Christian medical school, in one of the poorest countries in the world, fits us quite well. We would be meeting a medical need and a discipleship need at the same time, word and deed together instead of one or the other. There are many loose ends and uncertainties, and probably a lot of difficulties on this path as well, but such would be the case with any site we have looked at. Also, what helped us make the decision was that initially there was no obvious missions agency to send us to Burundi. Almost no one is working there right now, aside from the Free Methodist church who runs the school, and we didn't feel like that would be the best fit for our group. But through a series of events, it seems that an organization called World Harvest Mission, known and recommended by our home church, is interested in partnering with us and starting a new site in Burundi with us. They are a small non-denominational organization with only a few medical missionaries so far. The ones we know are great though, and WHM's two longest serving docs are on their way to Kijabe hospital near Nairobi, to work part time and be the area field directors the rest of their time. They would be our oversight, which is exciting to us as well. So, next steps. We're beginning the application process to WHM, although we won't know for sure if they would commit to accepting us and the work in Burundi until their board meeting in April. We won't become "official" WHM missionaries until after we attend a week-long candidate school back in the US, likely next fall. In the meantime, we hope to take another scouting trip to Burundi and take a closer look at the hospital and some opportunities there. We need your prayers now more than ever, as we seek to confirm this calling from God. Pray that the right doors will be opened and closed to us, and that our calling would either be confirmed or not. Thanks for coming along with us on the journey, and we are excited to be bringing you along. Stay tuned for an (anticlimactic) update, part III, on some new blog features in the next week or so. So excited to hear the way things are looking! We'll continue to pray. Praying for you guys! It's gotta be nice to hone the path! I've been praying for you all! It is so exciting to see God leading the way. Keep us posted! Love to you all...Linda S.